Rachel H. Park, BA1, Stephen J. Pollock, BSc2, Richard P. Phipps, PhD2, Howard N. Langstein, MD2, Collynn F. Woeller, PhD2. 1University of Rochester School of Medicine and Dentistry, Rochester, NY, USA, 2University of Rochester Medical Center, Rochester, NY, USA. Background: Breast cancer is the most common malignancy and second most common cause of cancer deaths in US women. The mainstay of breast cancer treatment is surgical resection, both lumpectomy and mastectomy, often followed by radiation therapy. More patients are now opting to undergo breast reconstruction after mastectomy with a majority choosing implant-based reconstruction. Unfortunately, many women, especially those who receive radiation therapy, face capsular contracture, a devastating complication that causes pain and disfigurement. Ionizing radiation drives and exacerbates capsular contracture in part by activating a cytokine milieu, including the master regulator of wound response, transforming growth factor-beta (TGF-β). TGF-β promotes myofibroblast differentiation and proliferation, leading to excessive contractile scar formation. Methods: A small molecule library containing 20,000 unique compounds was screened for anti-TGF-β activity. A number of structurally diverse anti-TGF-β agents were then tested on primary human capsular fibroblasts. Fibroblasts were irradiated or not, and then treated with both TGF-β and candidate compounds. Cells were then analyzed for the myofibroblast phenotype using markers including alpha-smooth muscle actin (αSMA), collagen I, Thy1 (formally called CD90) and periostin, using Western Blot, qRT-PCR, and immunofluorescence. 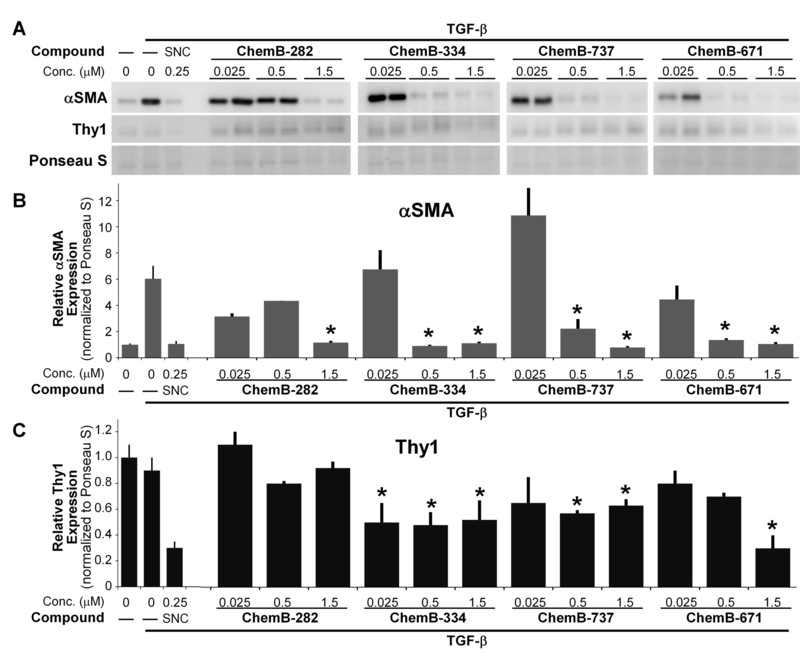 Results: Fibroblasts treated with TGF-β showed significant increases in αSMA, collagen I, and periostin levels (protein and/or mRNA), demonstrating and increase in the myofibroblast, or scar cell, phenotype. Interestingly, fibroblasts treated with TGF-β and 10 Gray (Gy) radiation showed significantly increased levels of myofibroblast markers, suggesting TGF-β activation is increased by ionizing radiation. Cells that were treated with the novel small molecules showed significant reduction in myofibroblast markers (protein and/or mRNA; Figure 1) to the levels of untreated control cells, therefore indicating successful reduction in myofibroblast differentiation. Candidate small molecules blocked myofibroblast formation even in the presence of radiation. Cellular morphology was studied both before and after the treatments using bright-field microscope and immunofluorescence; fibroblasts treated with only TGF-β displayed robust myofibroblastic features, showing broad cells with prominent contractile fibers. Fibroblasts treated with both TGF-β and small molecules retained fibroblastic features, showing narrow, elongated cells without such prominent contractile fibers. Conclusions: Novel small molecules with anti-TGF-β activity can effectively prevent human capsular fibroblast to myofibroblast differentiation in vitro, even in the presence of radiation. These results highlight novel therapeutic options that may be utilized in the future to prevent radiation-induced capsular contracture.